Avocado of Mexico: I will be there- Meet me! 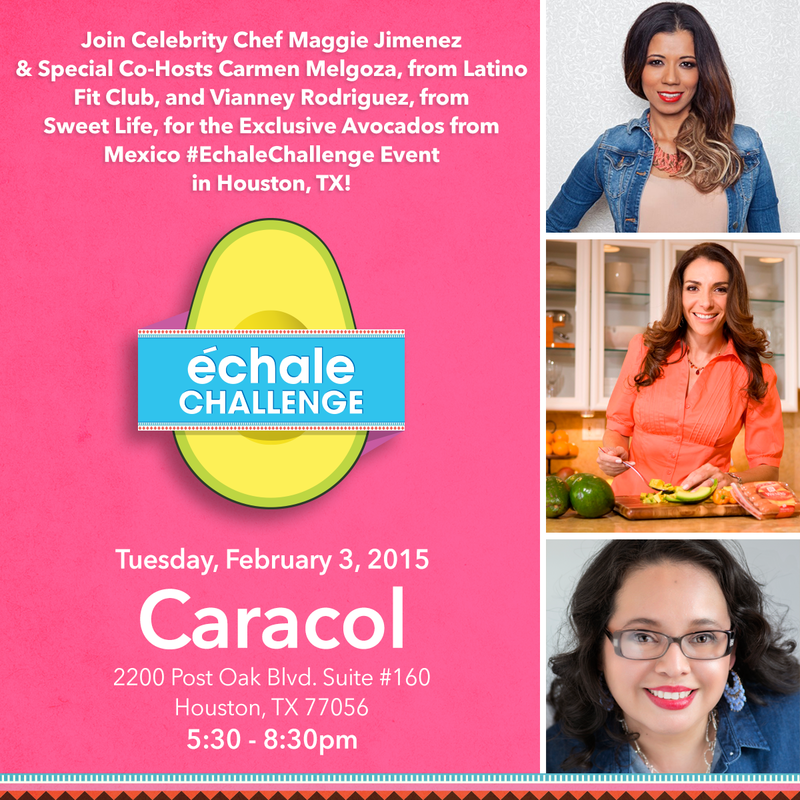 I am thrilled to cordially invite you to a media & friends event on Tuesday, February 3 at the beautiful, Caracol Restaurant to kick off the Échale Challenge, a program created to help everyone have a more energetic, fulfilling and flavorful healthy life! Our host for the evening will be celebrity chef/TV host Maggie Jimenez who will be talking about the challenge and we’ll chat about how to incorporate avocados into your everyday life! Please RSVP as soon as possible to ensure a swag bag and let me know if you would like to bring up to 10 family members or passionate followers of yours. *I know, I know...let me SPOIL YOU!!! You MUST RSVP so I can ensure a space for you and your guests. The 21-day Échale Challenge begins February 9, 2015 and will award most active participants on social media who show how they incorporate more exercise, fruits and vegetables to their diets with exciting weekly prizes and a grand prize of $10,000. This is a fun and rewarding way to put the passion back into your and your family’s lifestyle, you’re already posting great pics so might as well enter them to win! Please visit facebook.com/aguacatesdemexico to sign up for the 21-day challenge and access recipes, tips and health information or www.echalechallenge.com.